The main road to Taunton from Devon and Cornwall used to pass through the Whipton before reaching the city. The village was bypassed in the 1930's by the Pinhoe Road. Honeylands was a prominent house built in 1711, and owned by the Hare family who ran the Devon and Exeter Stores that was situated in Exeter High Street, just opposite Bedford Street. The Hare's moved out to the Red House Hotel in 1920 and in 1923 a member of the Wills Tobacco family donated Honeylands to the City Council. It became a sanitarium for children who suffered predominantly from TB. It is now the Vranch House School for children with physical difficulties. Another important facility is the Whipton Exhibition Site. From 1956 it was the home of the annual Devon and Exeter Show before it moved out to Westpoint Arena in 1989. It is now used for the Exeter Arena, an athletics facility. The name comes from the Saxon owner of the land, Wippa - hence Wippa's Farm. 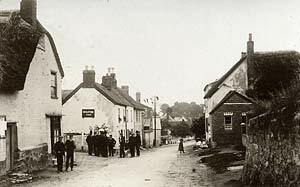 The centre of Whipton at the turn of the 20th Century. 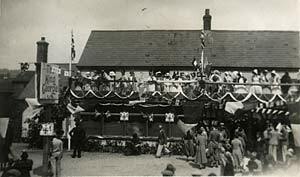 The Whipton Inn, possible during the celebrations for George VIs Coronation.